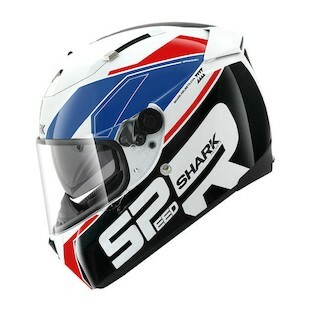 The Shark Speed-R in the new line of helmets from Shark Helmets, has the best features of the Shark Race-R Pro (Moto-GP race helmets), but a sportier version of the Shark Vision-R. It has a fiberglass composite shell, intermediate oval head-shape, more aero-dynamic venting, chin vent, anti-fog and anti-scratch shield. As with the other helmets in the line, optically correct face shield. There are a range of 6 different optional cheek pads if needed with easy-fit glasses system. The liners are antimicrobial and the fleece, lining are softer than in the Vision-R with the addition of a neck roll. 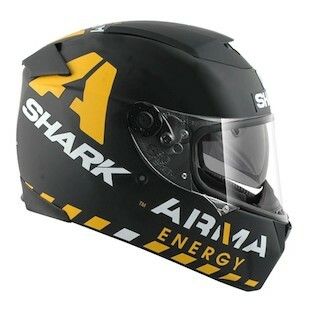 All these helmets are predisposed to Sharktooth communication systems, a neoprene chin curtain wind collar and double-d ring connection. The Shark Speed-R is available in Shark Speed-R Sauer, Shark Speed-R-Solid, Shark Speed-R Ike, and the Shark Speed-R Redding Replica. Be sure to check out other options by visiting our sportbike helmets page.